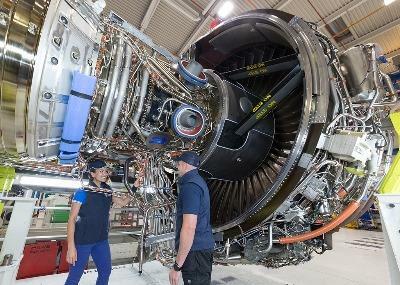 CEVA Logistics has completed Phase One of a major global inbound aero logistics project for Rolls-Royce. Starting in 2017 and running through the first half this year CEVA has been responsible for designing, implementing and managing the domestic, regional and international shipment of aerospace parts for both the civil and defence divisions of Rolls-Royce. Over 1,200 shipments per week with an average weight of 300-500 kgs and ranging from and small parcels to out-of-gauge are moved into multiple Rolls-Royce facilities across the UK, Germany, US and Singapore. By establishing three global control towers at Ashby-de-la-Zouch, UK, Singapore and Jacksonville FL, and by utilising its Matrix Supply Chain Management global platform CEVA has been able to transform the way Rolls-Royce manages its inbound inventory. In order to achieve this CEVA has transitioned some 800+ individual Rolls-Royce suppliers onto its Matrix system to provide Rolls-Royce with a single source for the data and visibility of its shipments. This new level of visibility has enabled Rolls-Royce to dramatically reduce the volume of expedited freight it requires and introduced a reduction in transit times which are measured against agreed Service Level requirements. "We are delighted with the success of this ongoing project," states Leigh Pomlett, Executive Director of CEVA Logistics. "Using our business intelligence tools has enabled Rolls-Royce to have a new level of part visibility and at the same time interrogate their cost base to precisely match their business requirements. This rich supply of data then enables us to support the future evolution and continuous improvement of their supply chain". To support the further development of the project CEVA is now working in tandem with Rolls-Royce to develop new opportunities for optimizing the transportation modes to further eliminate supply chain costs. Domestic plant to plant shipments and a new cross-dock solution combined with Matrix mobile are also planned for Phase Two of the project.